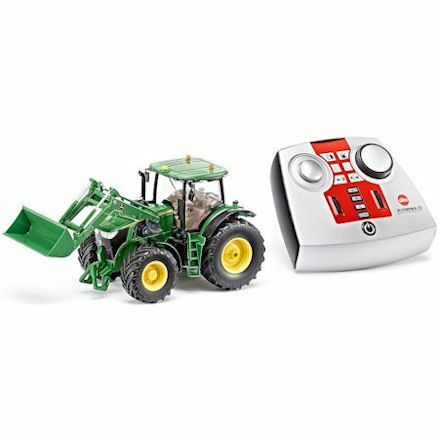 Go remote with the Siku Control32 series, r/c tractors in 1:32 scale, with functional parts and powerful features. 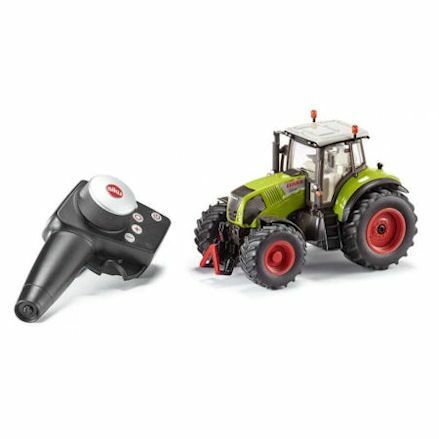 Play farms hands free with Siku R/C tractors for sale in the UK, all the benefits of Siku's die-cast tractors, but equipped with radio control technology. Each model comes with a 2.4 GHz radio control module - a controller - realistic steering, headlights permanently switched on during operation, which uses three standard AAA batteries - not included. 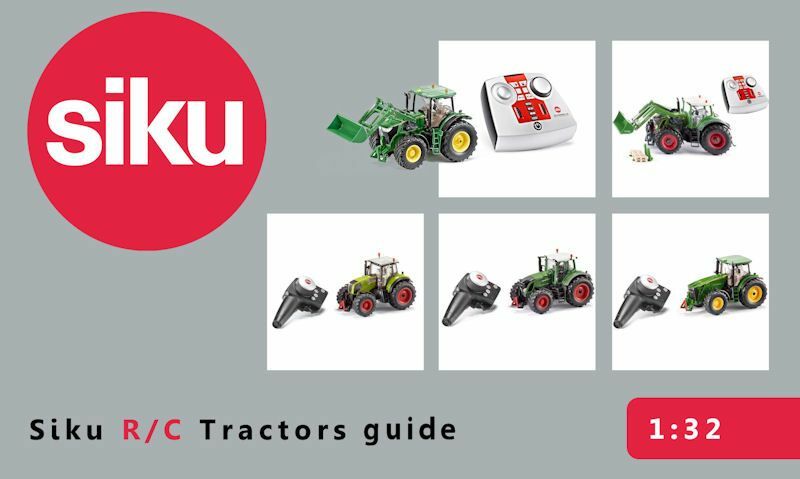 Since 2017, their are currently five radio control tractors in the series, with Siku offering matching radio control trailers, which are also remote control. 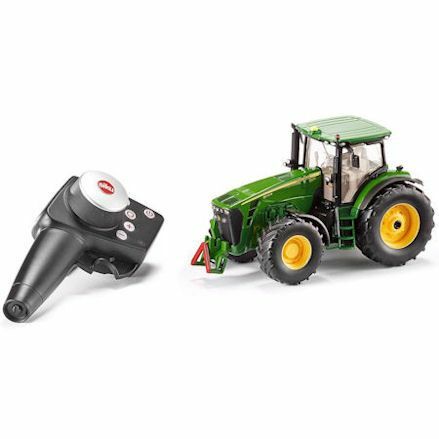 But remember, you'll need three AAA batteries for the tractor, plus 2 AAA batteries for the controller. You can keep an eye on the latest tractors from the official Siku Control32 range, but let's go ahead and look what's available from the series now. Latest John Deere remote control tractor from the 7R series with a remotely controlled, fully functional front loader - and servo-powered rear coupling system. The shovel and front loader arm are individually powered by two servos, well the light on the cab roof has white front LEDs and red LED rear lights. Visit official Siku product page or go to our product page for more detail. Buy it from Amazon.co.uk. This Siku Fendt 939 Vario tractor features a fully functional electronically controllable front loader - supplied with shovel and pallet fork attachments. Each attachment requires switching from one mode to the next for the feature to function like real life. As usual, it comes with working lights, remote controlled rear coupling and steering. Visit official Siku product page. Buy it from Amazon.co.uk. 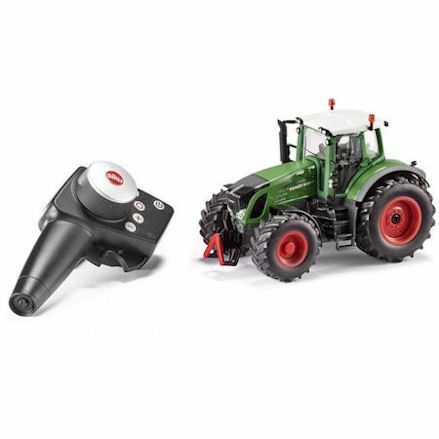 Siku lower price Fendt tractor with radio components using the 2.4 GHz wavelength with all the benefits of the expensive range. This model has precise driving and steering functions, permanently switched on rear and font lights during operation. Visit official Siku product page or go to our product page for more detail. Buy it from Wonderful Models. Like the model above, this is Siku's cheaper model and the latest addition to their Control32 series. Once again it is equipped with all the power and technology as the expensive range, including steering, working lights, rear coupling and moves at a fair old speed when you open her up. And finally, here we have the Siku Claas Axion completing the Control32 series in the low end of the series. This Claas tractor won't go unnoticed thanks to it's bright green body and stunning red wheel rims. All the functions are included as we've explained above. Visit official Siku product page or go to our product page for more detail. Buy it from Elite Toys and Models.